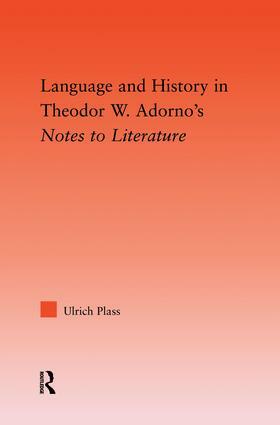 Language and History in Theodor W. Adorno's Notes to Literature explores Adorno’s essays on literature as an independent contribution to his aesthetics with an emphasis on his theory and practice of literary interpretation. Essential to Adorno’s essays is his unorthodox treatment of language and history and his elaboration of the links between the two. One of Adorno’s major but often-neglected claims is that truth is relative to its historical medium, language. Adorno persistently and creatively tries to narrow the gulf between truth and expression, philosophy and rhetoric, and his essays on literature are practical examples of his effort to critically rescue the rhetorical dimension of philosophy. Rather than relying exclusively on aesthetic concepts inherited from his predecessors in the Western tradition (Kant, Hegel, Nietzsche, Kierkegaard), Adorno’s essays seek to transgress and transcend the conceptual limitations of aesthetic discourse by appropriating a non-conceptual, metaphorical vocabulary borrowed from the literary texts he investigates. Thus, Adorno’s interpretations of literature mobilize an alternative subterranean, primarily essayistic and fragmentary discourse on language and history that eludes the categories that tend to predominate his thinking in his major work, Aesthetic Theory. This book puts forth the claim that Adorno’s essays on literature are of central relevance for an understanding of his aesthetics because they challenge the conceptual limitations of philosophical discourse.